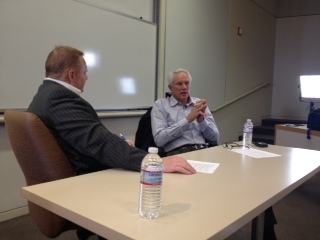 Mitch Kupchak, General Manager of the Los Angeles Lakers, came to the UCLA Anderson School of Management to speak with the Sports Business class about his career as an NBA player and his current role with the Lakers’ front office. Following his incredibly successful career as a player, winning 3 NBA Championships with the Los Angeles Lakers, Mr. Kupchak received his MBA from UCLA’s Anderson School and transitioned into the front office of the Lakers. He spoke about what he believed it took to be a good General Manager of a major sports franchise, and what he believes are the advantages that the Lakers have as a franchise compared to other teams in the NBA. Mr. Kupchak then went into the transition that occurred in the front office after the passing of Dr. Jerry Buss. While it has been a sad time for Mr. Kupchak and those involved with the Lakers, Dr. Buss’ beliefs and his passion for the game are still strong and at the forefront of the minds of all involved in the front office. They have not missed a beat since Dr. Buss’ passing, and they are still doing everything they can to keep the Lakers as a world-class franchise. After, he went in depth on how he and other teams look at constructing an NBA. He explained to the class the financial restraints of NBA franchises and how teams are becoming more risk averse and are focusing more and more on team management rather than overpaying for talent, from the repeaters tax, to max level contracts, to differing salary approaches. He also spoke about the use of technology in the front office and how rapidly things are changing. While analytics is an expression that can be overused at times, it is an important part of evaluating talent and is something that is definitely considered when looking at a player. Mr. Kupchak was also able to speak about the spread of social media and its relationship with athletes, the evolution of sports media with the advancement of technology, D-League and NCAA player development in relation to the NBA, and much more. He was also able to field questions from the students in attendance, with topics including Mr. Kupchak’s personal motivation, his business relationships with top-tier players, and what franchises have done the best job during the current offseason. 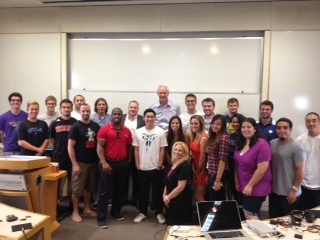 With all of his experience and knowledge, Mr. Kupchak was an incredible guest speaker. It was an experience of a lifetime for students to have such access to one of the most high profile General Mangers in all of sports, and everyone at UCLA Anderson sincerely appreciated him taking time out of his day to speak to the program. Image | This entry was posted in Guest Speakers, Uncategorized. Bookmark the permalink.